Valentine’s Day was as nice as could be – until after dessert. We’d had a fine day, Sarah had exchanged valentines at school, and Jason and I exchanged lovely cards. Sarah even gave her current favorite boy a small bunch of roses (so cute!) I finished sewing Sarah a dress she had asked me to make her – using the treadle sewing machine given to me by our neighbor. Jason and I saw a coyote in the back yard, looking at our black cat. After taking a couple of photos, we made our presence known and it ran away (and the cat ran inside). 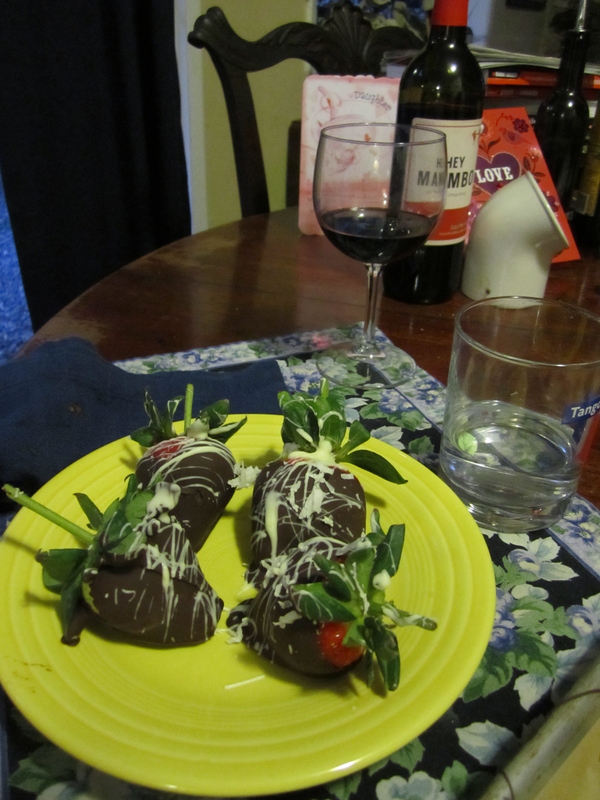 We had a delicious osso buco and polenta dinner and for dessert homemade hand-dipped chocolate-covered strawberries. Yum! Then the trouble started. Jason went outside to chop a little wood for the wood stove, and realized a cat was outside – in the dark! We had forgotten to close the cat door! So I went outside and wound up chasing our orange cat all the way around the house and finally getting him in. Whew. Closed the cat door and took a head count: one orange cat, one black cat, no calico. Where was Sadie? What followed was a frantic search both indoors and out for our favorite cat. She was nowhere. And this cat always comes when called, always stays near the house, never in a million years would run away or go exploring out of earshot. We scoured the house, including closets, the attic, under beds, under covers, in the bathtub – everywhere. Jason called and searched everywhere outside with a flashlight: around the house over and over, down the driveway, and up the hill behind the house where the coyote had been. Where the coyote had been. After half an hour, I lost hope. She wasn’t inside. If she had been outside while we called, she would have come. 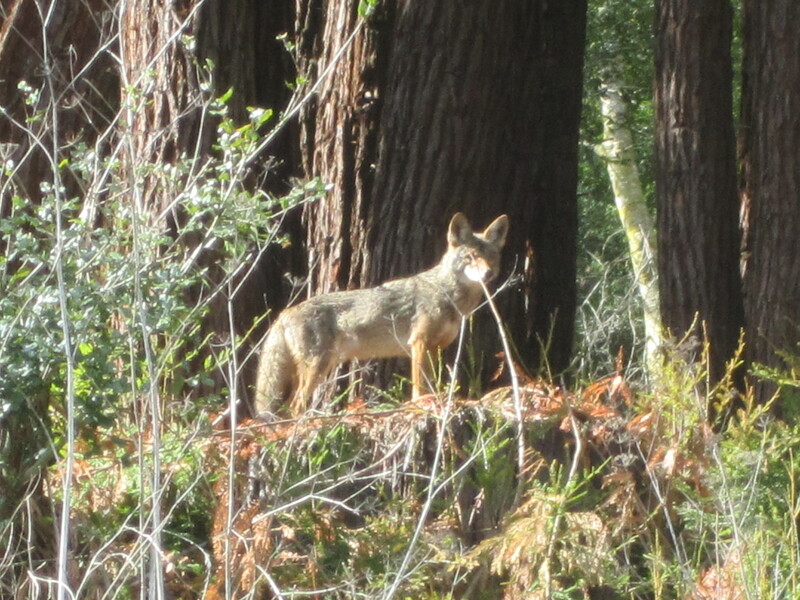 The coyotes must have gotten her, and I felt I needed to get used to that reality. And I felt I had to get Sarah used to that reality too. I tearfully explained the situation to Sarah and then just sobbed. Jason kept looking, outside and in, but I felt it was futile. “She’s gone,” I told him. I wasn’t in any shape to put Sarah to bed, so Jason took her up to her room. Just before tucking her in, he made one last stab at looking for Sadie. He looked into Sarah’s huge box of stuffed animals. 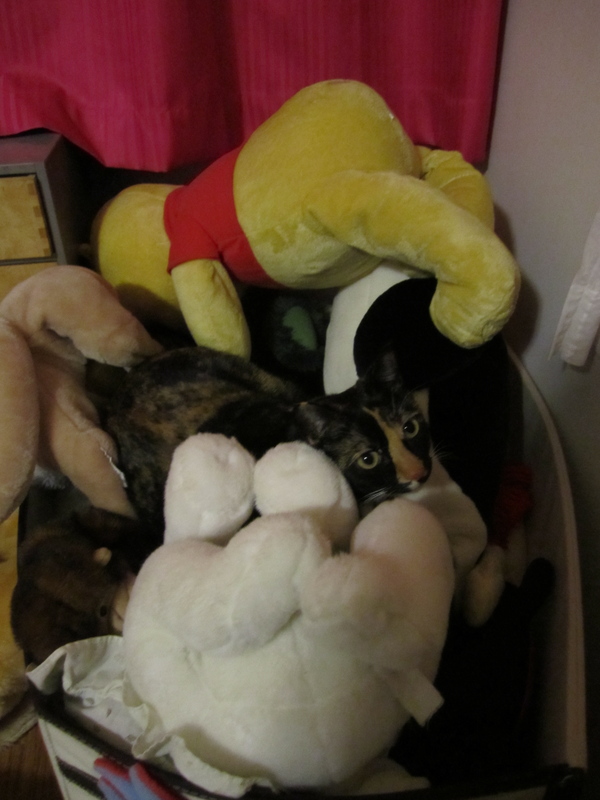 There she was, fast asleep, buried way underneath the stuffed animals. What a joyful reunion – with many hugs and kisses for the groggy and confused cat, and tears of joy from me. Why that cat slept through all our calling I will never know, but I am so relieved and grateful to have her with us, safe and sound. Not half an hour later we heard the coyotes howl. They sounded like they were right next to the house. I double checked: all humans and cats inside, all doors closed and locked. They got something else – this time.